OK, a slight bit more substance. You never want to freak out over one month’s numbers in this biz, but when a monthly result reflects other stuff going on in the economy—in this case, slowing growth—you want to give that monthly number a little more weight. So that explains my first and second impressions of this morning’s jobs report. 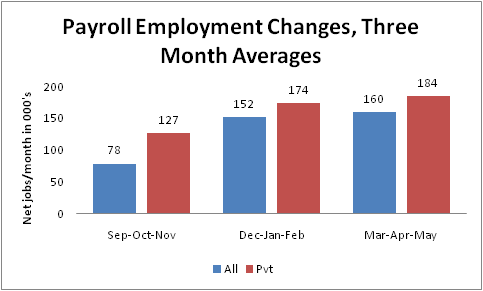 –with the three-month averaging, the growth rate of payroll jobs has not really decelerated. May’s result obviously goes the other way, but the general trend has been a bit more positive. –private sector payrolls are growing more quickly than overall, because the state and local sector continues to cut jobs. Over the past year, they’ve shed over 300,000 jobs. –wage growth is really a problem here. On an hourly basis, yearly growth of nominal wages have been stuck below 2% since last February. That’s below recent inflation, and it means that only way families can get ahead is with more hours of work. For that option, see today’s jobs report. —most importantly, smooth all you want, fact is that job growth is just too slow to provide working families with the job and income opportunities they need. OK, I’m not a speechwriter. But that’s the gist. And by no means should that preclude us from setting a balanced path toward a sustainable budget. It’s just too early to set down that path. Pivot to what? See this, but I was also thinking this AM (hat tip, TM) about the Rivlin/Domenici idea for a full-year, full-bore payroll tax holiday, both on the employer and the employee side. Why this idea? It’s of significant magnitude, the first name of the commission that proposed it is “bipartisan,” it cuts labor costs to employers and boosts paychecks of workers, who will spend the money, generating useful second round effects. And Alice R and Pete D ain’t exactly wild-eyed radicals, which matters in this town. (Ezra Klein has touted this idea too lately, but I couldn’t find the link). Give Chad’s write-up a close read—he nails the details. Share the post "Third Impression of the Jobs Report"
28 comments in reply to "Third Impression of the Jobs Report"
Hey, If people aren’t working, then they can’t pay taxes which increases the deficit. And collecting unemployment benefits and other government help which increases the deficit. It would seem to me the best way to bring down the deficit is not to cut! cut! cut! but to work! work! work! Dear God, you want to pivot to a program utterly designed to insure the destruction of BOTH Social Security and Medicare in the worst downturn since the Depression and after a crash that pretty much decimated most middle and working class citizens’ retirement savings. I get why you are suggesting this, since the blinders the size of football fields that the administration you worked for kept them from seeing that 1.) supply side theory has been demolished in the last thirty years, 2.) the middle class had just taken a hit big enough to sink almost all of them, 3.) the poor and lower middle class had been hanging on by their fingernails since before the crash, 4.) the banks and investment class had no interest in small business or anyone else in the country, 5.) Unemployment was only going to grow and grow big time unless you created demand and created it for a good time to come – while changing both the trade and the tax policies that had encouraged us to become an import nation. So instead of going proactive and bold and honest about the financial nightmare we were in, instead of real long term stimulus & jobs program they decided to make the banks whole. And now they do not have the means to go bold and post active. But screw making things worse in the very long run for the 90% who didn’t get bailed out the last time, that is NOT the answer. The real question is whether there is any hope Obama would ever do this. I’m sure I’m not the only one who’d like your take on the odds of the administration ever pushing for such an obviously necessary policy. @crin – you could still credit the Social Security Trust Fund with the money as if contributions were made. The only real glimmer of hope I can see on the horizon is the brewing “settlement” of all the mortgage fraud cases now being “negotiated” by the Justice Dept, the Bank regulators and the State Attorney Generals. I think the only possible way we can help unstick the economy and get demand improved is to finally effectively deal with the collapse in housing prices and make the BANKS eat the losses rather than middle class homeowners. The Banks have demonstrated that they have no interest in actually helping the economy improve. So, we will have to force them to disgorge about $50 billion to wipe the slate clean on Mortgage fraud and also re-sent millions of home mortgages to current FMV. This will crreate a massive wealth effect, also, and will probably have a multiplier effect of 2 to 3 times the actual amount of the settlement. Somewhere between 90-150 billion in “stimulus” will goose demand. When was the last time the government effectively negotiated against Mega-Biz and didn’t limp away licking its wounds? One word for you: Obamacare. Or two words: single payer. Or three words: Goldman Sachs. (That last one was a stretch, I know). The truth is that any settlement is going to, by it’s nature, a boon for these banksters. The truth of the matter is that if the banks were to remain on the hook for their stupidity, there would be no large scale American banking system, and in case you haven’t noticed it is one of the few business that employs Americans. If you think some state AG is going to dismantle the system because a financially illiterate couple in Florida was illegally foreclosed upon, after being duped into a mortgage for twice the value of the property… you’re dreaming. No, Obama is going to do what he has done thus far, slap the banks (on the back), make sure they don’t cry when people call them names, and tell Joe Average to vote Repubo next time around… if they dare. The other thing Obama snd Geithner should do right now is to announce that all federal spending in GOP Congressional districts will get immediately cut off if the debt ceiling is not raised. You could exepmt a few things such as military pay and benefits. But — No mail delivery. No federal courts. No FEMA. (Unless the Congress specifically authorizes deficit spending for a disaster). No farm subsidies. no SS benefits or medicare benefits. Etc. Sorry. No soup for your constituents until you vote to increase the debt ceiling. The people who are not represented by idiots will continue to receive federal funding as usual. its a lousy idea and is already going on anyway-wasn’t that part of the obambi “deal” with the republicans to extend the tax cuts to the wealthy? c) businesses don’t hire because they get a tax break especially one that goes away they hire because of demand. The only thing that will increase demand and kick start the economy is to make jobs whether they are government or infrastructure rebuilding or whatever and get people back to work. Then finally with money in their pockets they will spend and the private sector can take over. This isn’t rocket science but it requires a leader who stands up and says it day after day and of course we haven’t had that in more than a decade. Yep. All I’m hearing are short-term fixes with seriously detrimental long-term implications. The entire Village is determined to make the middle class into scapegoats for politicians’ utter incompetence. Now more than ever: why has the Administration never put its foot down wrt the Chinese peg to the dollar? We’ve lost 40% of American manufacturing jobs and 39% of American factories have closed just since China joined the WTO. There has been much talk about increasing exports and export related jobs and some suggestions that a weak dollar will help in that regard. But clearly ‘weak dollar’ has a much reduced meaning when China is not included in the countries the dollar is weak against. Furthermore, with the peg, dollar weakness is translated into export competitiveness for the Chinese in many non-American markets. Is this what is appears to be – putting the profits of MNC’s exporting from China above the interests of American workers, for reasons of politics? Does Obama have to lose an election to get the message that his job is to take care of Americans, not Afghanis or Iraqis or MNCs? I am all for a tax holiday. Been saying it for some time. Problem will be that if they only do a tax holiday it will be just like the stimulus; not enough. 1) Giving states money to rehire public sector employees. 2) Spending on infrastructure projects. If they just do a tax holiday you will end up in a worse situation because the deficit hawks will just claim victory because it will not have the impacted need to simulate the economy. I’ve got an idea! How about we tax the banksters and their nefarious flash crash computer trading and give this money to the states for infrastructure projects and schools and cops and firefighters? Doesn’t social security pay out about $700B a year? That’s more than the entire non-defense discretionary budget and way, way more if you take out veterans affairs. So in the current political climate, the idea would be to what? Eliminate the federal government in toto to save $600B while adding $700B to the debt and dramatically shortening the lifetime of the accounting surplus of social security, pretty much guaranteeing its demise. Wow, national seppuku. Looks like your commenters aren’t buying another tax cut as the solution. No wonder. It plays right into the hands of those who would then scream “Medicare and Social Security are broke! Slash benefits!” It gets business off the hook for years of keeping more and more of the gains from their workers’ productivity. Find some way to reverse that trend, by seeing to it that employees have some collective bargaining rights. Do you actually believe there are any influential voices in the Administration who want to make that pivot? I’m incredibly pessimistic that the Administration is even willing to target unemployment, if it’s going to cost them inflation, budget deficits, and the other hallmarks of what Beltway media types consider serious grownups. A tax holiday may work for people with jobs. But doesn’t social security count on money coming into the system? How about a different kind of tax holiday. Remove the penalty and taxes on 401ks for the long term unemployed. Free up that money to pay off mortgages, or buy much needed new cars or for everyday living expenses. Does it cut into your retirement savings? Hell yeah. But if you aren’t working, haven’t been for awhile and don’t expect to soon, your chances of retiring aren’t so good. Better to pay off debt and learn to live on less with a much less interesting or profitable job. Much easier to downsize without a massive mortgage over your head. Ooo, I’ll bet that gives mutual fund managers the willies. If it’s a little like eating the seed corn, that’s where some of the unemployed are right now. It’s a national disgrace that they’re taking such a huge tax hit for withdrawing their 401k money early while the wealthy enjoy more tax cuts. I’m not there yet. I still have severance and unemployment and I’m ridiculously optimistic about working again. But a year from now, that 401k account I left at the company-who-must-not-be-named is going to look pretty tempting. Taxes should be used to regulate the economy and are not really needed to fund Federal spending. The collection of taxes removes money from the economy. If there is inflation raising taxes can reduce consumption (one tool). Raising taxes is not needed for Federal spending. It is needed for states to spend. The treasury can issue t-securities for funding although that is not needed from a operational standpoint but that is what is done. There is no risk of the US operationally defaulting. But there is a risk of politicians not allowing the Federal government to make payments. It’s called unwillingness to pay. But don’t tell that to your bank. The Federal government creates the US currency, which as most people know, but some seem not to forget. Lowering taxes alone with not be enough to create a significant amount of jobs. But it will help families allowing in some cases more discretionary funds and in other for payments to be made. More people spending and fewer foreclosures will be helpful but will not turn unemployment around. The problem with your analysis is it misses the bigger point – the workforce size from which the employment and unemployment numbers is computed has shrunken because the government statistics do no adjust for the available workforce pool, a fairly fixed number relative to overall population size. When you correct the data to reality, your analysis falls all apart. Is there something about being an insider Beltway economist that causes one to develop a strange behavioral tic that manifests itself by uttering the words “tax cuts” as a response to any economic question? Or are Beltway economists chosen because of this trait? Tax holidays for payroll taxes are a great idea, but, when will someone say out loud what the true effect of taxes are on business? I keep hearing the crazy talk go unchallenged. ‘You can’t tax the job creators’. Does no one understand that if the “job creators” face the fork in the road, either keep your money and pay full taxes on it (not dividend rates) or invest it in your company by hiring more, upgrading factories… the “job creators” will invest the money. It’s the dividend tax rate that is draining the reinvestment. Taxes should go up on “job creators” to steer them into reinvestment instead of hording. Look at how the oil companies treat their windfall profits. Most of the money is used to buy their own stocks back and paying dividends mostly to their own board and executives. If they had to pay full income tax rates on dividends, they wouldn’t do that. They would reinvest. Jared, I think you’re the man to take this to the masses. Heck you did a bang up job on MSNBC Friday! First, I realize I’m late to the party, but some of us work for a living…. Second, this is probably a really stupid question, but I’m not an economist, nor did I study it, nor do I play one on TV. I keep hearing: people will work more, or fewer hours to adjust their income in the face of outside factors: taxes, etc. But I don’t have a job where I get to determine how many hours I work. My employer does that. And, since I am a salaried employee, I can work as many hours as I want, but my pay doesn’t change. If I skate, and work fewer, my pay won’t change, either. And working more hours won’t necessarily get me a raise, either. I work for a very large corporation, and raises are pretty strictly controlled. So who are these mystical people who can–and do–regulate their income by adapting the hours they work? Are they the same as those rational people who are constantly maximizing their utility? There are no stupid questions in this biz. There are, however, stupid answers. And your question is a good one. It’s true that few hourly paid workers can adjust their hours in any meaningful way. Salaried people often enjoy more flexible work hours, but it doesn’t always effect their pay. But when wages a lagging, people can and do take other jobs, often part-time, to help make ends meet. But that’s awfully tough in a climate of high unemployment. I’m also more than a bit concerned that the “solution” to Americans’ falling wages (in real dollars) is to “work more.” Americans are already among the longest-working (in hours per year) people in the industrialized world and take the least days of vacation per year. Yet it’s somehow a rational, and realistic, solution for us to work even harder, at even more jobs, for even less pay? Don’t any of you remember when our previous President held up the example of a woman who worked three jobs as “uniquely American”? How did people to the left of the political center respond to that? Why is that philosophy- work non-stop until you die- now held up as the way to climb out of this Depression? Jared, my man, if there’s going to be a payroll tax holiday, let’s not do it on the employer side at all. It just gives them cash and they have plenty and are not spending it. Cash for workers is much better, so spend the money on them. And, you should always, imho, mention that the funds will be reimbursed to Soc Sec. or people will be concerned you’re weakening it. the danger is that the conservatives like this policy and hope for a permanent cutback in the payroll tax.